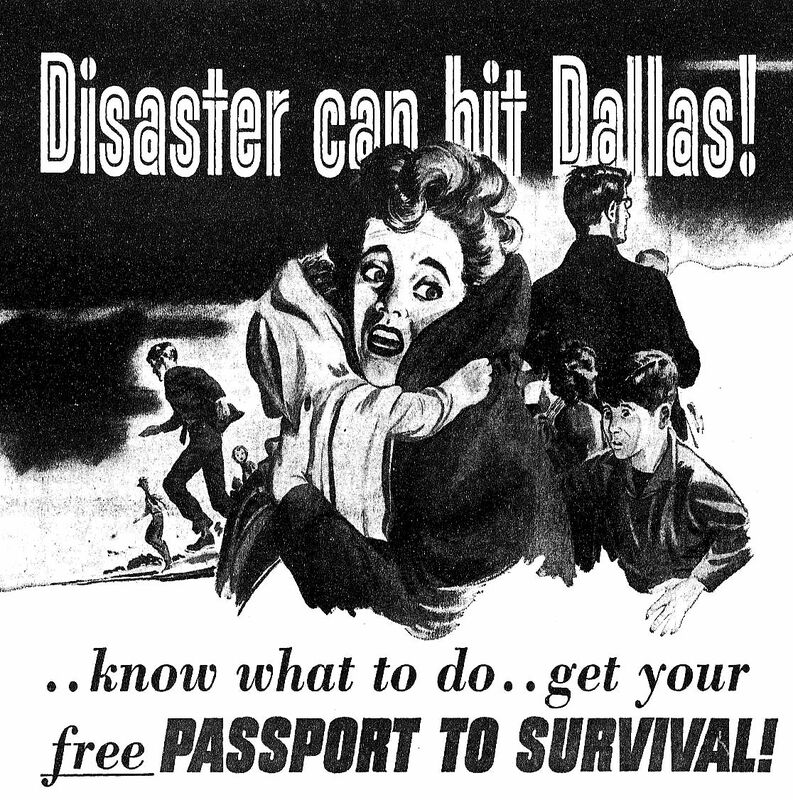 The arrival of Passport to Survival (“presented as a public service by your friendly Mobil dealer and Magnolia Petroleum Company”) was heralded by a newspaper ad in November, 1958 (its eye-catching “DISASTER CAN HIT DALLAS!” artwork is seen above). (The full ad — with an exhortative letter by Commission chairman John W. Mayo, addressed to the people of Dallas — can be seen here.) I’m not sure how much “survival” there would be in case of a nuclear attack, but, like a good Boy Scout, one should at least be prepared. Backyard bomb shelters were necessary in Britain during World War II and saved countless lives during the almost nightly German air raids (I wrote about these shelters on another blog, here), but it was a new concept to post-war America. 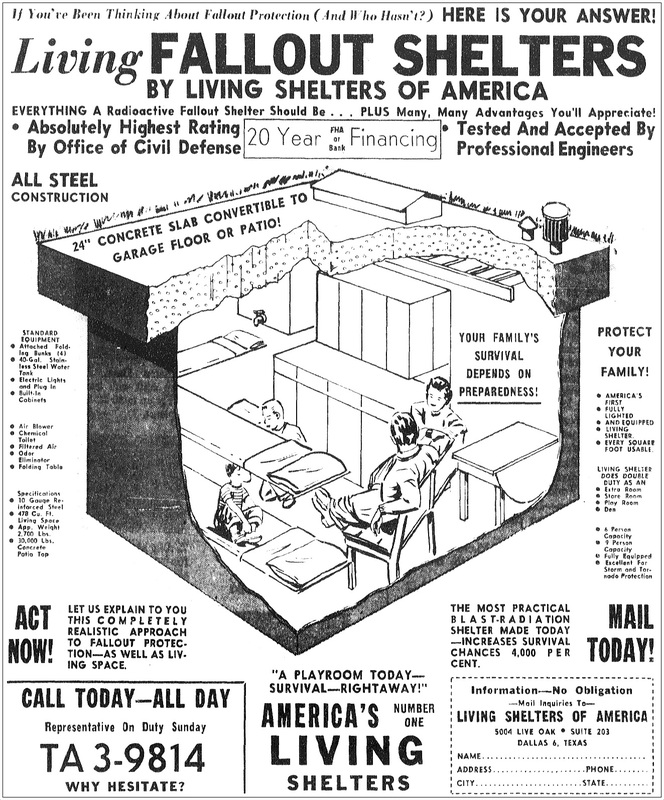 It wasn’t long, though, before bomb shelters became all the rage in the early ’50s as the Cold War heated up. If it’s becoming a common reference-point on the country’s funny-pages, it’s hit mainstream acceptance. I’m not sure how many people were building these shelters, but they were certainly talking about them. When Highland Park Village announced their new underground parking garage in 1953, owners Flippen-Prather made sure to note that the two subterranean parking levels (the lowest of which was 20 feet below street level) would not only accommodate 300 vehicles, but, if needed, it could serve as a bomb shelter for 3,500 very well-dressed Park Cities residents seeking refuge. 1961 was THE year if you wanted to get into the bomb-shelter business. There was even a three-day “Fallout Survival Show” at Market Hall. You couldn’t open the pages of a magazine or newspaper without seeing ads for personal bomb shelters. Again, not all that many people were actually building them, but everyone was certainly talking about them. But in just a few short months … no one cared anymore. The ads disappeared. A lot of people who had been trying to sell them went broke. 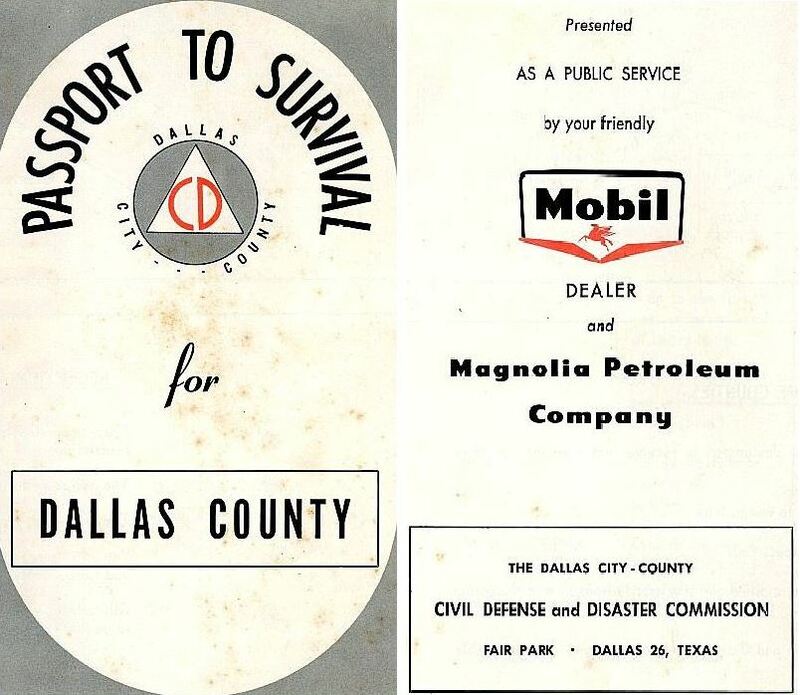 Those who survived (as it were) repurposed their products as “storm shelters” — turns out tornadoes were more of a pressing threat to Dallasites than Russian A-bombs. Some of the permanent provisions kept in these places were water, food, “fortified crackers,” hard candy, bandages, iodine, and Geiger counters. As one might expect, many of the city’s fallout shelters were in downtown buildings, their exteriors adorned with official Civil Defense signage. My favorite? 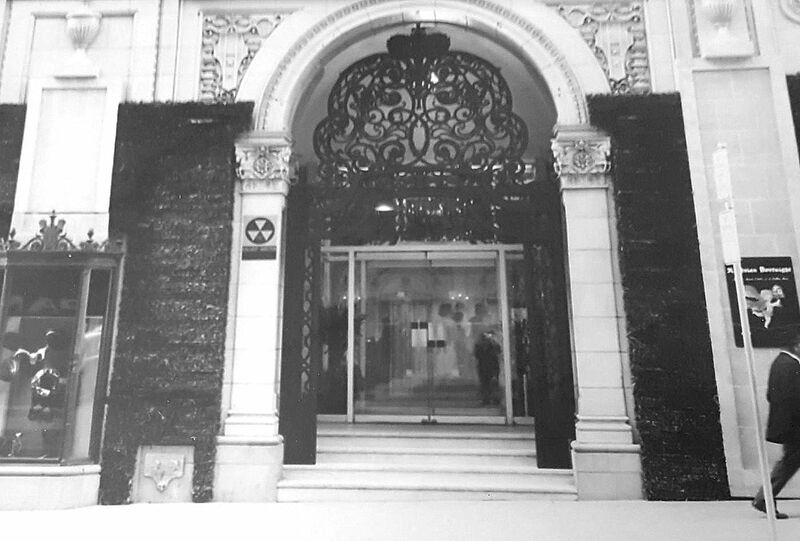 Neiman-Marcus, of course, seen below in 1965, decorated for the Austrian Fortnight. If I were able to choose where to huddle during a nuclear attack, I think I’d choose Neiman’s. I’m sure Mr. Stanley made sure his basement was comfortable, tasteful, and well-appointed. …And one would have to expect he wouldn’t have had his guests living off hard candy and fortified crackers. 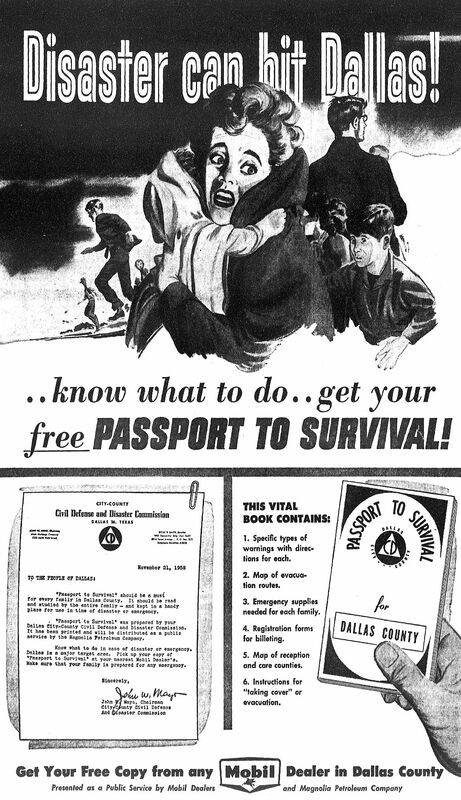 Below are images from the 1958 publication Passport to Survival (thanks to Jeff Hanning for his original scans, which precipitated this post) — all images are larger when clicked. 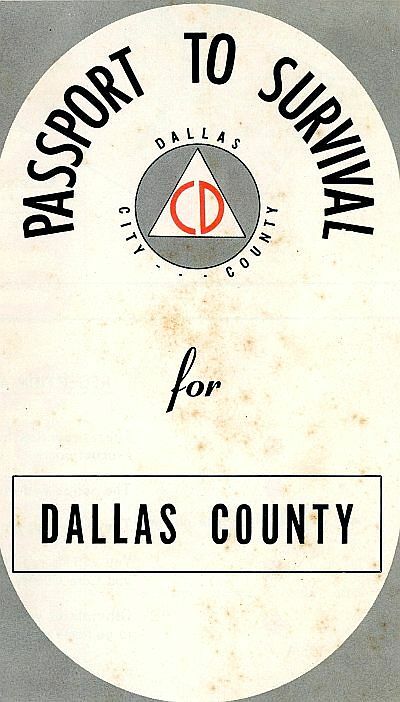 Thanks again to Jeff Hanning for sending me scans of his Passport to Survival, Dallas County pamphlet. The photo of Neiman-Marcus is from the DeGolyer Library at SMU. The above image is a really bad photo I took as a reference photo for a project I was working on at SMU last year. The actual photograph in the DeGolyer collection is, of course, much better! Apologies to the DeGolyer Library! I would link to the photo in SMU’s online database, but a scan of that particular photo is not available. 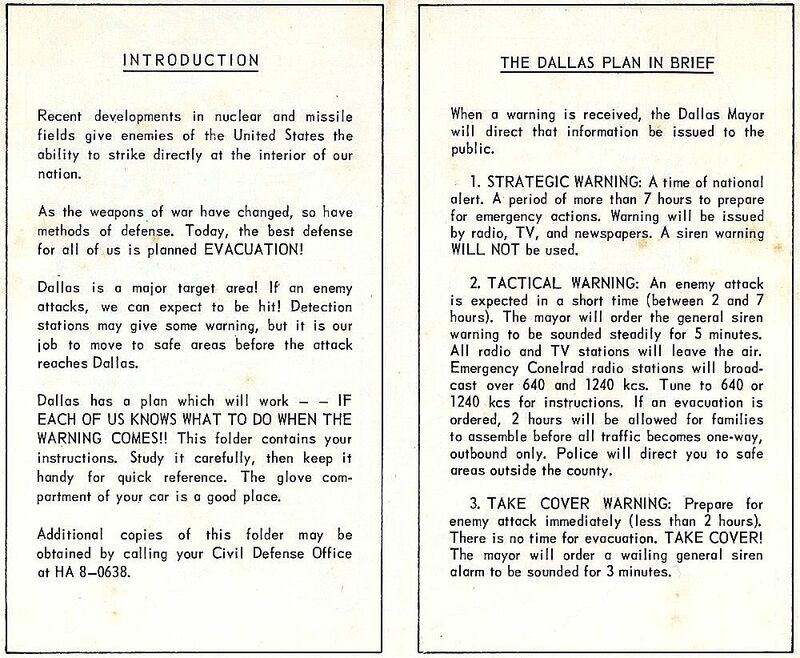 As mentioned above, if you’re interested in Civil Defense in Dallas, the CivilDefenseMuseum.com site is where you need to be. There’s TONS of stuff there. In addition to the great video walk-though of the old Fair Park shelter, there are also several pages of photos here (click through all the pages by following the links at the bottom of each page). 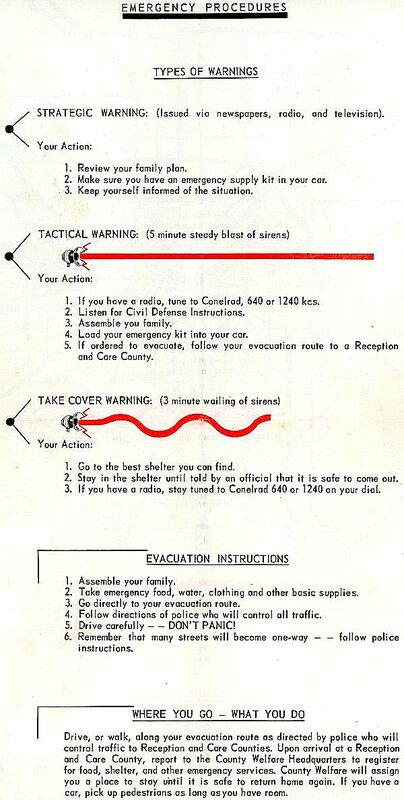 More on the history of United States Civil Defense, here. And two stories from the Lakewood Advocate on Dallas’ Civil Defense shelters and preparedness can be found here and here. I noticed on the map that Midway Road was labeled as Dooley Road? When did the name change and why? I’ve lived in Dallas my entire life and never knew that! Hmm. I think it may just be a misprint. I see mentions of Midway going back to the 1920s and Dooley going back to the 1930s, but Dooley looks like it might have been the name of Midway as it left the city limits. 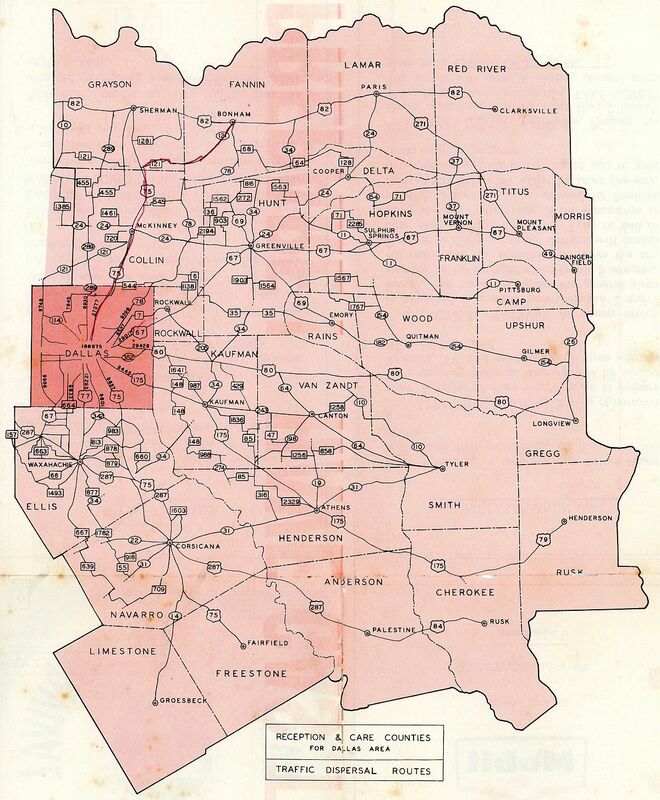 It definitely wasn’t Dooley south of Forest Lane — looks like the names changed near where LBJ was built. 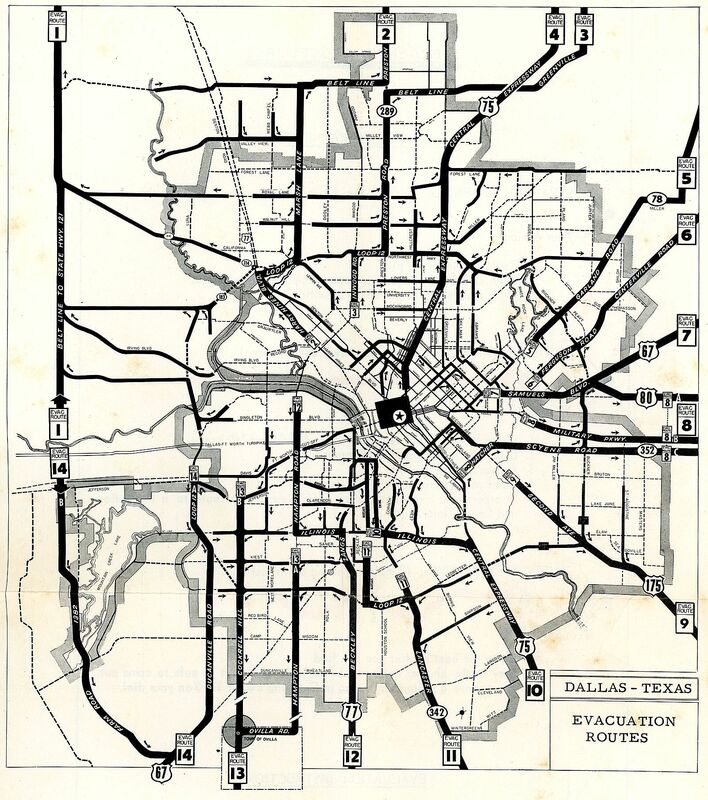 Maybe “Dooley” was on the map because that was the name of the road that got you OUT of Dallas during an evacuation? Kind of strange, though. 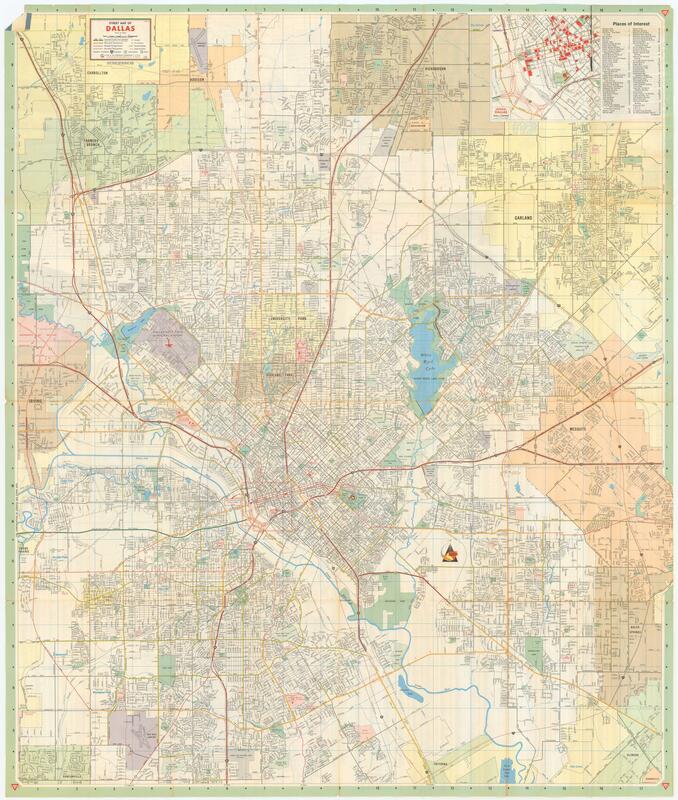 You can see Midway/Dooley on maps through the years on this incredibly helpful site: http://www.dfwfreeways.com/old-highway-maps (some of the links show very high-resolution scans). This is beyond great – thank you Paula!